Hot off the presses from Japan was news of the PC Engine Super Grafx which looked to build on the already impressive original. New custom chips meant it could chuck around 128 sprites (up from 64) and the cartridges saw a decent boost in size. Perhaps the most intriguing aspect was the Power Console add on which the console slotted into and featured a full on steering yoke, a gear stick/throttle, LCD clock/timer, LED radar display, numeric keypad and a bunch of buttons and knobs. The UK Video Games Team lead by C&VG Editor Julian Rignall triumphed over their French and Spanish rivals in the first European Video Games Championships. Ocean had signed "Battle Command", the sequel to Realtime Games' classic "Carrier Command". Two Atari/Tengen coinops - "Escape from the Planet of the Robot Monsters" (just rolls off the tongue) and "STUN Runner" - were getting home computer conversions courtesy of Domark. Spiderman and Captain America were taking on Dr Doom in Entertainment International's "Dr Doom's Revenge". Also from the software house was a 16bit port of "Space Ace" from the same team behind the impressive Amiga version of "Dragon's Lair". There was a review roundup of compilations which saw "The Hits" from Thalamus taking away the highest score with an impressive 97%. A company called Mention Technical Services were offering gamers the chance to have an actual arcade machine at home. At £199.99, the Personal Arcade Plus was a cabinet plus JAMMA setup. To be honest, these cabs looked pretty crap. An Arcade Action pullout "megabook" (15 pages). This month's "Incredible Hologram" was of Ghostbusters II. There was also an "Amazin'" "I'm a Hard Driver" badge. 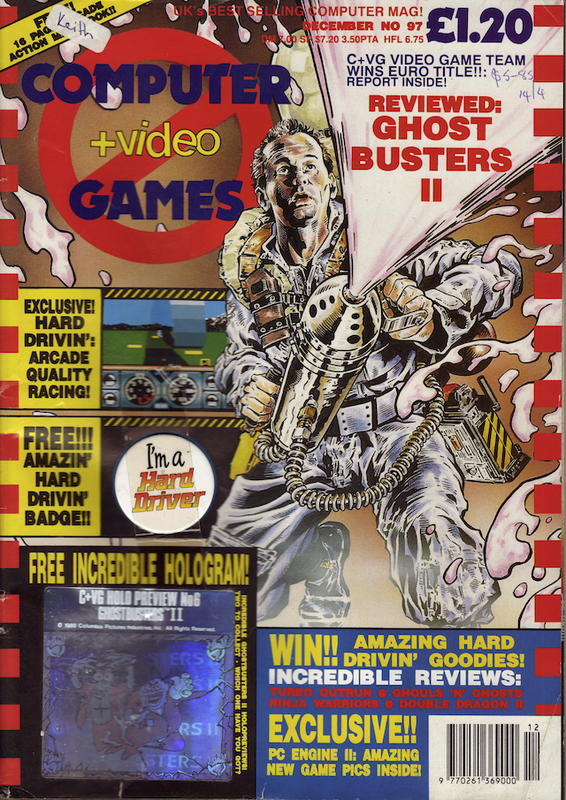 "Ghostbusters II" Activision - ST 85% C&VG Hit "A great license which puts the movie's action sequences to very good use in three varied and playable levels." "Double Dragon II" Virgin/Mastertronic - ST 80% "An accurate conversion of the popular arcade combat game which beat 'em up fans should relish." "Turbo Outrun" US Gold - C64 93% C&VG Hit "The speed you need and all the frills you want come together in the most incredible driving game yet seen on the C64. An astounding conversion which shouldn't be missed." "Chambers of Shao Lin" Grandslam - ST 82% "Doesn't have the instant playability of IK+, but the quest and character creation elements give Chambers of Shao Lin plenty of lasting appeal." "Rock'n'Roll" Rainbow Arts - Amiga 89% C&VG Hit "Rainbow Arts' most impressive release for a long time. Great graphics, superb sound, infuriatingly addictive gameplay and the urge to 'just finish that level' all come together perfectly in one neat package." "Omnicron Conspiracy" Imageworks/First Star - PC 90% C&VG Hit "A conspiracy on a universal scale means a lot of hard detective work for a Star Cop (as well as a few lucky breaks) but the feeling of accomplishment with each new lead is immense. Rake out the dosh if you fancy your chances at cracking this superb adventure." "Interphase" Imageworks - Amiga/ST 89% C&VG Hit "A wonderfully-executed blend of strategy and arcade action. Superb 3D graphics, hours of intriguing gameplay and a cheeky sample from Pink Floyd's 'Wish You Were Here' assures its success." "Ghouls 'n' Ghosts" US Gold - ST 88% Spectrum/Amstrad 85% C&VG Hit "An accurate conversion of the hit coin-op that's tough, but very addictive." "Damocles" Novagen - ST 95% C&VG Hit "If you thought flying around in Starglider II was good, wait 'til you get a load of this. Damocles is an experience to behold - and one not to be missed." "Ninja Warriors" Sales Curve/Virgin - Amiga 86% ST 85% C&VG Hit "Ninja Warriors has transferred from coin-op to computer extraordinarily well. The graphics are small, but well-defined, and a novel loader ensures a wide variety of assailants throughout. Play is tough, but it's a conversion that hack 'n' slash arcade fans will relish." "Switchblade" Gremlin Graphics - Amiga 93% C&VG Hit "A smashing platform game which combines unbelievably addictive gameplay with great graphics and sound. If you thought Rick Dangerous was good, this'll blow your socks off!!!" "Hard Drivin'" Domark - ST 92% C&VG Hit "A stunning conversion that contains all the features of the arcade game and plays brilliantly. An absolute must for all boy racers." "Axel's Magic Hammer" Gremlin Graphics - ST 83% "Alex Kidd on the ST? Not quite, but an impressive game-of-the-genre, which gives ST owners the chance to play console owners at their own game." "Scapeghost" Level 9 - Amiga 88% C&VG Hit "Despite the occasional glitch, I rank Scapeghost as Level 9's most enjoyable adventure. Their most enjoyable adventure of all time, in fact, because sadly Level 9 have announced this is to be their final adventure." "Bloody Wolf" Data East - PC Engine 86% C&VG Hit "Poor graphics and sound belie a challenging and highly addictive combat game which keeps you engrossed for hours at a time. Superb!" "Toobin'" Domark - Amiga 83% ST 82% Spectrum 78% "Looks, sounds and plays great. An excellent conversion of Tengen's weird and wonderful coin-op."